At the outer reaches of the imagination, youll find Olympus. Its a colorful planet, illuminated day and night by twin suns and three moons. While the suns burn brightly in the Olympian sky, the brightest stars of this strange and wonderful place are seven young, out-of-this-world characters. This adventurous group is led by a young boy named Hector, who is wise beyond his years. He and his friends… stumble into one entertaining adventure after another, always to discover theres a valuable lesson to be learned!In this exciting, brightly illustrated installment of the adventures of Hector and his friends, the Olympians, Hector helps readers learn all about how to do good things. 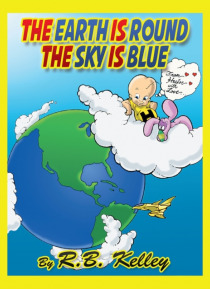 From being grateful to mom and dad to sharing, Hector demonstrates the great things that come from being kind and doing good deeds.With engaging illustrations and fun, easy-to-read text, The Earth is Round the Sky is Blue is the perfect book to read with your little ones any time of day.